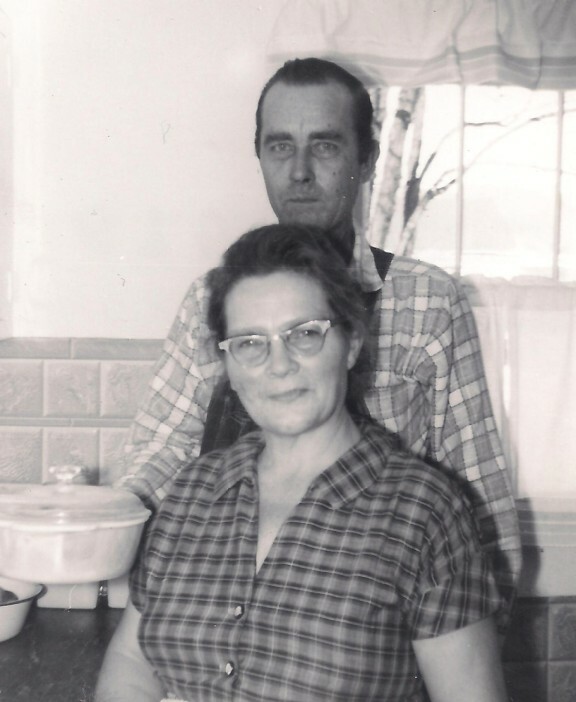 Roy and Jewell Ledbetter were photographed in the kitchen of their home on Airport Road. Do you remember that time? .... That’s a phrase just about every member of the Roy Lee Ledbetter and wife Jewell (Flatt) Ledbetter said many times to each other on a Friday night when they recently all gathered for a weekend reunion at Standing Stone Park. I was invited to join them to reminisce and to look back at the time when they were growing up. Their family story begins when their mother, age 19, married their father, age 17. Roy and Jewell met while attending church at Howard’s Chapel, and on December 21, 1934, they married. For the first couple of months of their married life, they lived with Roy’s parents, Thomas Walter Ledbetter and wife Linnie Mae Ledbetter. They later rented a four room house from Addison Bilbrey and wife Maggie once located just north of the city limits on old Highway 42. Eventually, the family moved to house on Airport Road. As time went along, nine children were added to the family. Their names in the order of their births are: Dalphine; Lorene, Sue; Joyce; Donald; Patricia; Fern; Judy; and David. Dalphine was 19 when David, the youngest of the family, was born. Roy made a living for his family by farming and working in a saw mill. The Ledbetter children all grew up in a time when the facts of life were never talked about, but the older girls soon figured out one thing for themselves. When a new baby was about to be added to the family, their mother would get out a box of baby clothes and sit that box at the top of the stairs. Every time the box appeared, the girls knew it wouldn’t be long until a new baby arrived. Only one of the nine children was born at the hospital, and that was David, the youngest. All of the other eight were born at home. The first doll Dalphine had was a gift from Addison Bilbrey’s mother, a lady everyone called Ma Bilbrey. The doll was placed on a neighbors’ Christmas tree and tied with a big red ribbon. When Dalphine started to school, she rode a truck type school bus that had two wooden benches in the back. Dalphine remembers one of the first times she rode the bus, her mother walked with her to the road to wait till the bus came along, and when she got on, there was no place to sit, other than in Terry Mitchell’s lap. That’s how she got to school that day. In the summer months, the Ledbetter family had lots of company to come visiting. Jewell cooked huge meals for these special times. Aunts, uncles, and cousins would come and bring watermelons and sometimes ice to make home made ice cream. Some of their cousins, Betty and Bertha Hawkins, Joan and Billy Ledbetter, and a close friend, Johnnie Vaughn, were all like part of their family. Sunday afternoons would often be spent walking in the woods looking for hickory nuts. When cousins and friends spent the night at the Ledbetter house, the beds would all be full, some sleeping crossways in the bed, and sometimes on pallets on the floor. Lorene was involved in a terrible accident when she was young. She was working for their neighbors, Albert Mitchell and wife Maude, and one day while doing some house cleaning for them, Maude Mitchell handed Lorene a cigar box to put in the wood stove to burn. Neither one had any idea that the cigar box contained gun powder until it exploded. Lorene was badly burned and spent two weeks in the hospital recovering from the burns. She still today carries the scars of that terrible accident. The family owned a battery operated radio, but it was not listened to unless it was on a Saturday night. Friends and neighbors would gather at the Ledbetter house that night to sit around the radio and listen to the Grand Ole Opry. The kids would sing and dance on the nights they listened to the radio and really gave the floor in their house a good workout from all the dancing. Singing was something all the girls loved to do, and they often sang together as they did housework or any other chores each day. In fact, their dad thought the whole family was good enough that he should have taken them to Nashville to see if they might have been able to sing professionally. In his later years of life, he told Sue he regretted not doing this. With a family of nine children, there was always a big washing to do, and for many years, that task took place on a rub board and an iron kettle out in the yard. On wash day, the clotheslines and the fence row would be hanging full of wet clothes. Later, Dalphine bought the first washing machine her mother had. All the Ledbetter kids knew their beds had to be made every day before they left for school, and the girls were taught to do a really thorough job when it came to cleaning the house. The floors were scrubbed with lye soap and then waxed. Their method for polishing the floors after they had been waxed was to pull each other around the floor on an old rug. Even their front yard was swept every Saturday morning. Anytime company was expected, the house was given a really good scrubbing, not just the floors but the walls as well, and even the out house wasn’t left out. It was scrubbed throughly too, and a new Sears and Roebuck catalogue would be placed there especially for their guests. Patricia remembers how grand she thought their Aunt Maude’s out house was because it was a two-seater while theirs had only one. After Donald left home and married, and anytime he and his wife came home for a visit, the fact that the out house got an extra good cleaning, didn’t impress his wife in the least . In fact, she insisted that Donald drive her over to Carey Gore’s service station each time she needed to use the bathroom. One of Joyce’s favorite memories is getting new straw in their mattresses each spring. She told me she loved how fresh and clean they were to sleep on after new straw was added. Donald said they sometimes needed a chair to climb into bed after the mattresses were fluffed up with new straw. Something Joyce didn’t like to do was to go to the cellar to get canned items, or to have to go there when a storm came up. The cellar was a place that snakes liked, and Joyce was always afraid of finding one there. Something else Joyce didn’t like to have to do was to try and kill a chicken. Her mother would wring their necks when she killed them, and even though Joyce said she tried, she just couldn’t learn how that was done. Even when she tried to kill one on a chopping block, she couldn’t do that either. She said the chicken would lay there and look up at her, and she just couldn’t bring herself to bring the axe down on it. Just part of the Ledbetter family is shown in this picture. Standing in front: Fern and Judy. In spite of having such a large family, Jewell Ledbetter found time to sew for her daughters. A quilt rack hung from the living room ceiling and was always in use every winter. Each of the girls learned how to quilt and how to sew. Jewell made everything her children wore, even their underwear, and she didn’t have store bought patterns. She cut her own out of newspapers. Sue believes had her mother been given the opportunity, she could very easily have become a dress designer because of her special talents in sewing. 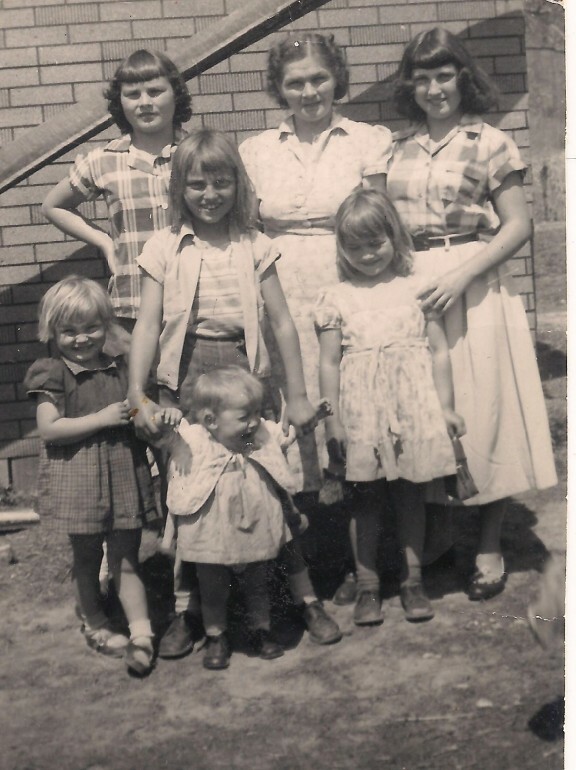 She made the girls sunsuits, little red coats with a matching tam, and always special dresses for Easter and Christmas. One Easter, it snowed, and Jewell was heartbroken when the girls had to wear their winter coats over the beautiful new dresses she had spent a lot of time making for each one. After that particular Easter, she always made a jacket or bought a sweater to match the girls’ dresses. Easter was also a time when the children looked forward to new baby chickens coming in the mail. After raising the chickens, they would be sold and the money used to buy new spring clothes and shoes. After having four girls in a row, the very first boy, Donald Roy, was born while his father was serving in World War II. Jewell was expecting Donald when Roy was called into service, and it wasn’t until Donald was eight or nine months old that he and his father saw each other for the first time. The day their dad arrived home after being discharged, the girls couldn’t wait for their dad to see his first born son. *The time when Donald was in second grade, Patricia in first. Donald came to Patricia’s room and asked her if she wanted to go home. She said yes, and away they went. *The Christmas Joyce cut a great big Christmas tree rather than the small one the family usually had. That was the year angel hair came out, and that big tree got covered with angel hair. *The year Donald got a big red wagon for Christmas that all the sisters helped to wear out before he got to play with it as much as he would like to. *The year 1955 when Jewell, along with daughters Dalphine and Lorene, all had babies. David, the youngest Ledbetter family member was born, and both Dalphine and Lorene had their first baby daughters. The Ledbetter family has always been very close knit, but that didn’t mean they got along all the time. The younger kids remember a snowy, winter day when they were home from school, and Fern and Judy had a disagreement about doing housework. Fern didn’t think Judy wasn’t helping her like she knew she was supposed to do, so she picked up a fork and threw it at her. Judy must have ducked, because the fork ended up sticking in the top of her head. David was watching and when Judy began bleeding, he ran to the barn to get his dad. He told his dad to “Come quick. Fern has about killed Judy. There’s a fork sticking out of the top of her head.” Fern just knew she’d would get a good whipping over the fight, but for once her dad agreed that it wouldn’t have happened if Judy had been doing her part. Roy and Jewell Ledbetter were considered very strict parents, and stressed the importance of honesty, good manners, and that their children never go anywhere without looking their best. Fern told me their family didn’t have much, but they were always clean and neat. Being raised as a close knit family isn’t something they’ve strayed from as adults either. They remain extremely close and have never had any problems that keep them from always staying in touch. Dalphine calls each brother and sister weekly. The girls who live here still go out to eat together, go to yard sales together, and visit back and forth. Sometimes at Christmas, those family members who can, share the holiday together, and will call the others living away and sing Christmas carols over the phone. Joyce said, “We’re always there anytime one of us needs something.” The family gathers at least once and sometimes twice a year at Standing Stone Park for reunions. It was great fun to be able to share an evening with a family that doesn’t take for granted how important just being together is. In a day and time when it seems our priorities aren’t really what they should be, the Ledbetter family’s love for each other is a good reminder of how it’s the simple things in life that really count the most. Standing Stone State Park is the setting for this photograph taken of all nine of the Ledbetter children. 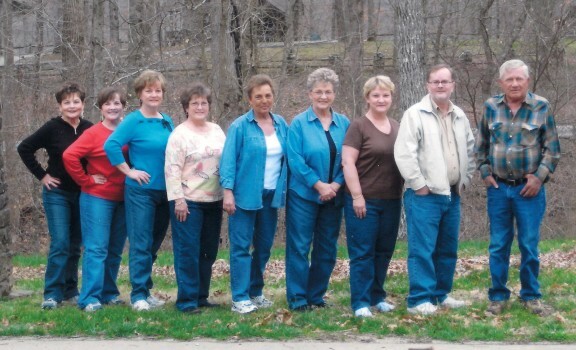 From left to right: Sue; Patricia; Fern; Lorene; Joyce; Dalphine; Judy; David; and Donald.